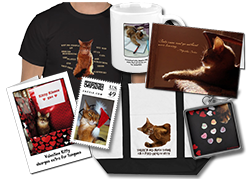 You are here: Home / Shop / Cat Stuff for Humans / Zazzle Special – 50% off Greeting Cards! Zazzle Special – 50% off Greeting Cards! I just found out that Zazzle is having a huge sale on holiday cards, so I quickly moved over a few of my cards so that you could take advantage! The code is CARD4HOLIDAY and you get 50% off! This is only good until Thursday, October 20, 2011 at 11:59 PM so hurry! And yes, I even have Thanksgiving cards! Eventually I will be moving all my merchandise over to Zazzle, but I don’t know when they are going to have an awesome discount like this again! Click here to see other items I have in my Zazzle store. 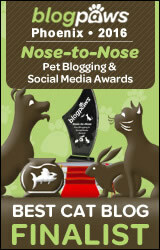 Pawsome cards! What a supermodel! I checked out the store–something seems a little goofy, esp. with shipping. I will try again tomorrow–I LOVE the one of you sprawled with claws extended. We love your holiday cards! It’s nice that Binga has a card too! We’ll check out your zazzle store. Those are really nice but I just sent away for mine and they’re stunning. Those are some really nice cards, Sparkle.